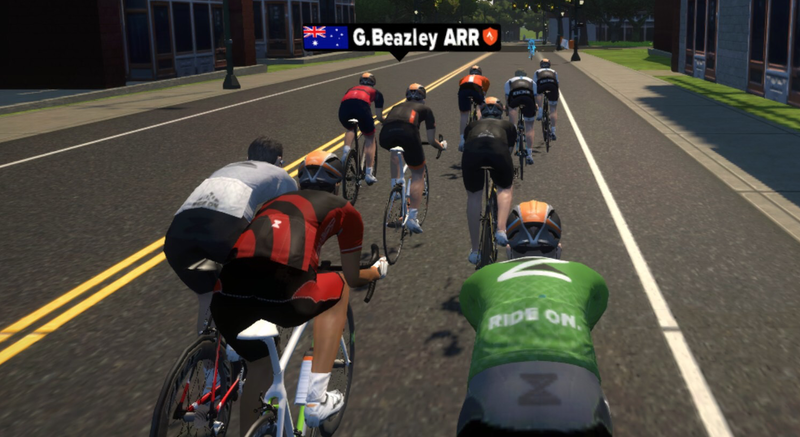 Tales from the llama...: Zwift Racing - How real is it? 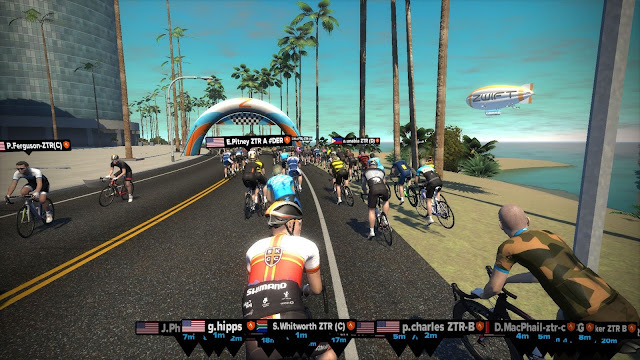 It's been 12 months since I first installed Zwift and started chasing friends and strangers around virtual roads in cyberspace. Back in the early beta on Jarvis Island, after only a few rides, I knew there was massive potential in the platform beyond just rolling around for fun and interval training. ZTR Wednesday - Pre roll-out. 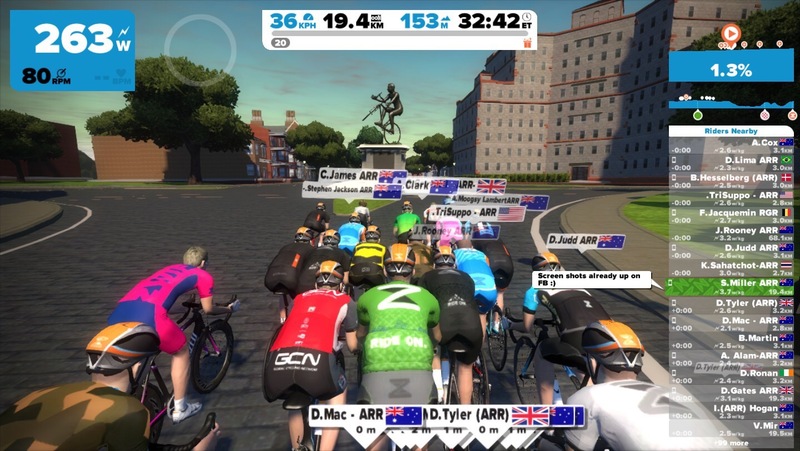 As the Zwift community grew and the group riding dynamics within the game were refined, organised events started popping up all over the place. While we're still on the edge of our seats (saddles?) waiting for the official Zwift event/race module, the Zwift community have already taken things to the next level. Training rides, tempo rides, races catering for all levels, automated results, race reports - It's all happening right now. The best location at this point is at http://zwiftcalendar.com. It'll show upcoming events in your local timezone with all the rules/details of the specific events listed within each entry. Take note of the route your event will go so you know which one to select when logging in. That's not a problem, this is a great way to start out. There's no entry fee, so there's nothing to lose. Just kit up, log in, and join in. Be prepared for some pre-race nerves. After all, you are up against real people who'll want to beat you. Don't let this be a hindrance, it'll prepare you for what you'll go through on race day outside. Just how "real" is this racing? Some cyclists will tell you unless you're on a fixed wheel, on the cobbles, in Belgium, in 1974, you're never really racing. Most of us ride indoors to maximize the time we have, and to replicate the efforts we'll be doing outside. From first hand experience, I can confirm the effort required to race in any category on Zwift is EXACTLY what you'll be doing out on the roads... in some cases it'll require more! 302W average for the 48km, NP of around 314. ~4.19w/kg. Depending on what level you're at, those numbers might not mean much.... the key is that I never hit the wind until 1.5km to go! Those numbers were me sitting in the bunch or on a wheel for the majority of the race, on a relatively flat course. After sitting in the bunch all race with 'fresh legs' (well, in reality, anything but! ), the finish was hotly contested over the last two minutes. 541W for 1:53 after just over an hour racing. 7.5w/kg. And you could throw a blanket over the three or four of us at the line it was that close. How real is the racing? The effort required is VERY REAL! It is the same across all categories, and even with those who get dropped and spend their time chasing back on. When you've got a virtual race number pinned on, the motivation to push yourself will be there. What really makes "just an ergo session" feel like real racing? The Effort - As outlined above, the physical effort is on par with real racing, across all categories. The Randomness - No two races are ever the same. One race may have riders pulling Nabali like moves on descents and Froome style attacks up the KOMs... and the next race it might all stay together for a massive bunch kick. Extending beyond just standard bunch races there could be hill climb TTs (on the proposed mountain pass climb), solo TTs, criterium / kermesse races on the newly opened Richmond flat course, multiple group handicap races (like the current Fox and Hound races), the possibilities are endless. If they open up some single-track on mountain bikes, there's a whole new world of opportunity there for dirt racing action! Given what I've seen and experienced so far, I predict the next 'big thing' will be the race/event module. Automated event joining, neutral roll-out, and instant results will get a lot more people participating and competing against others around the world during their ergo sessions on a daily basis. Details on exactly what it will include are sketchy, but from past updates we know the team at Zwift are on the ball with what the community wants. For now. Kit up and #RideOn! Virtual racing is already here and it's going to get bigger! Hi Shane just wondering do you have a reccomendation for trainer difficulty setting for racing. I have a kickr and run it on 100% for training rides but would it be a disadvantage in a race as I would be putting out minimal power on the downhill? Cheers. ~75% seems to be a good balance.